I have a great focaccia recipe on the site that I’ve neglected since posting. I’ve finally experimented with it and have fallen in love with it again. 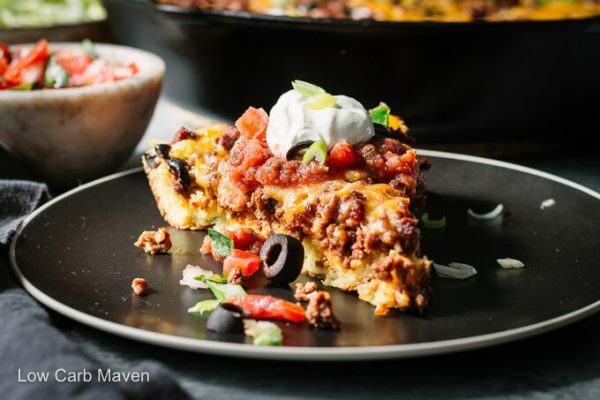 It makes an amazing base for this low carb taco pie. I grew up eating taco bake or Taco Pie. Mom added corn, black olives, beans, and veggies to seasoned ground beef then topped it with cornbread batter before baking. Mom’s simple, hearty Mexican cornbread casserole was warming and tasty on a cold night. At my house we called it tamale pie. 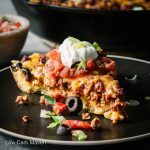 Low Carb Mexican Cornbread Casserole Taco Pie – YUM! 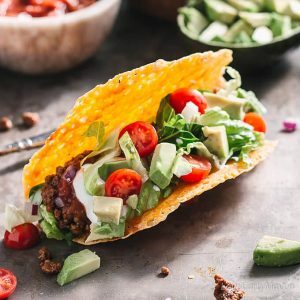 This low carb recipe is a quick and dirty version of mom’s using homemade taco seasoning and lean ground beef. I use the focaccia recipe for gluten-free “cornbread” base and bake the taco meat on top. To get a true cornbread taste without corn, I used Amoretti Sweet Corn Extract that found on Amazon. It is pretty pricey, but since it’s very concentrated, it will last for years. It really did taste like cornbread. 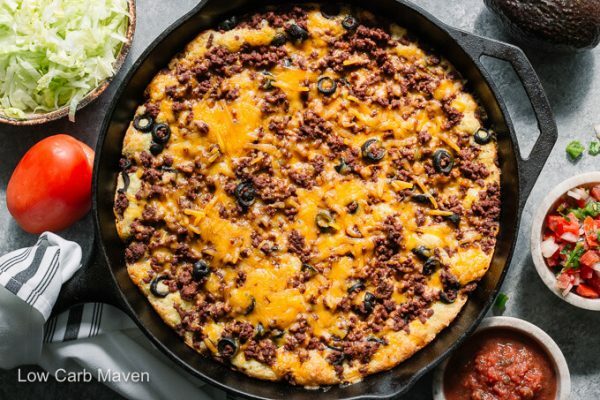 To prepare this low carb taco pie, I first cook the seasoned ground beef. While it cools, I make the “cornbread” base in the food processor and gently spread it into a greased 10-inch cast iron skillet. Spoon the seasoned ground beef on top, add some cheese and bake for 30-40 minutes. Just cut and serve. Topping with sour cream and salsa really brings all those great Mexican tastes together. We also added cilantro and sliced avocado. It was a great tasting family approved meal. 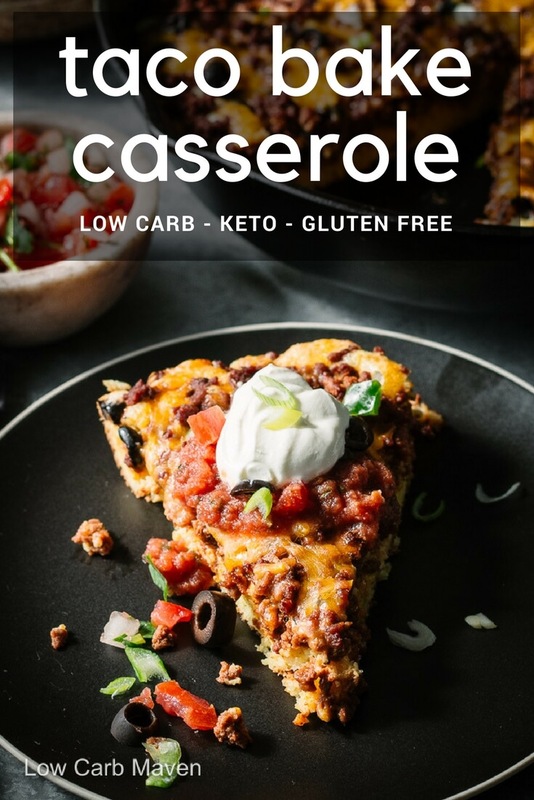 Low Carb Mexican Cornbread Casserole Taco Pie is 5 net carbs per serving. In a cold pan, set over medium heat, break up and cook the ground beef until very fine. Add the taco seasoning, tomato paste, and beef broth, cooking until much of the liquid is absorbed. Taste and adjust seasonings per your liking and allow to cool a little. Top the batter with the taco meat and bake for 35-40 minutes. Add the cup of cheddar cheese and return to the oven until melted. Let the taco bake cool for 5-10 minutes before serving. Serve with sour cream, salsa, guacamole, tomatoes, cilantro or black olives. Serve with a crisp salad. Serves 8. A reader left a comment on how he converted this recipe to coconut flour. He subbed 2/3 cup coconut flour for the almond flour and increased the number of eggs to five. This is so delicious! I made it for a potluck and everyone loved it. I have a food intolerance to almonds so I subbed 2/3 cup of coconut flour and increased the eggs to 5. It turned out amazing! This was SOOOOOOOO good. Never heard of corn extract but ordered it from your link. 2 Thumbs up. My carb consuming family members ate it and loved it. Note: the corn extract smells like heaven. Perfect addition to my arsenal of flavors. This recipe is a KEEPER. Kim, I made the “cornbread base” alone tonight, it turnsed out great. THANK YOU!! I have a question, when it is “alone” as bread, I can taste/smell the egg [not that bother me or not good] I wonder if you have any suggestions to add a bit some kind spice? 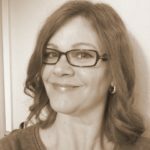 Thank you for sharing great recipes. I’m looking to try this recipe tonight, but just to comment to the weights…. I’ve tried your recipes with both standard imperial measuring and using a scale to use the weights you’ve provided on other recipes…. and, as expected, the weighted versions are by far superior. Your recipes are my go-to for anything baked and still keto friendly. Your command of alternative flours is amazing, and only need minimal adjustment for me a 4,500′ in altitude. SO GOOD. I had to make a few adjustments based on what I had in my kitchen. Used chicken bone broth instead of beef broth, and Rao’s sauce instead of tomato paste. Skipped the corn extract. The dish tasted absolutely delicious. The crust had a great texture and is honestly the most bread-like substitute I’ve had since going keto. Thank you for this recipe. Am looking forward to switching up the ingredients some more and maybe making an Italian flavored one! Thank you! Hiya, made your taco pie tonight. Fabulous results and tastes amazing…..loving all your recipes actually. I am confused about the cheese needed for the cornbread base. Is it 1 cup of mozzarella plus a cup of another cheese? Or just the cup of mozzarella? This was delicious and very satisfying. I left out the corn extract and used my own taco seasoning mix. My picky son wouldn’t eat it so I just made extra taco meat with regular taco shells for him. I will definitely make again and maybe add some black beans to the mix! Thanks so much for the recipe!!! 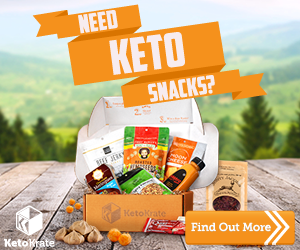 This is an ALL-STAR keto recipe!!!! How you came up with the “cornbread” texture is beyond me, but my husband didn’t know until after he ate it…the only reason he asked what it was is because he knows I can’t eat cornbread! I actually did a riff off this…we had beef tacos the night before, so I wanted to change it up with shredded rotisserie (C*stco) chicken. 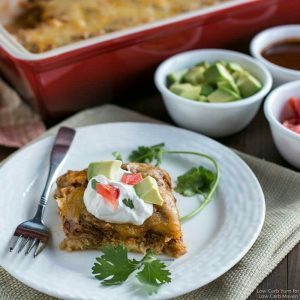 I did the batter on bottom, then some shredded cheese, chopped onion, Mezetta tamed chopped jalapenos, shredded chicken – then get this – drizzled some of your low carb enchilada sauce over it all and baked it. Then of course more cheese (a mix of monterrey jack & cheddar). Served with sour cream and guacamole (and the key to lasting guac is pureeing a tomatillo and mixing that in – the acidity will make the guac taste fresh for days!). 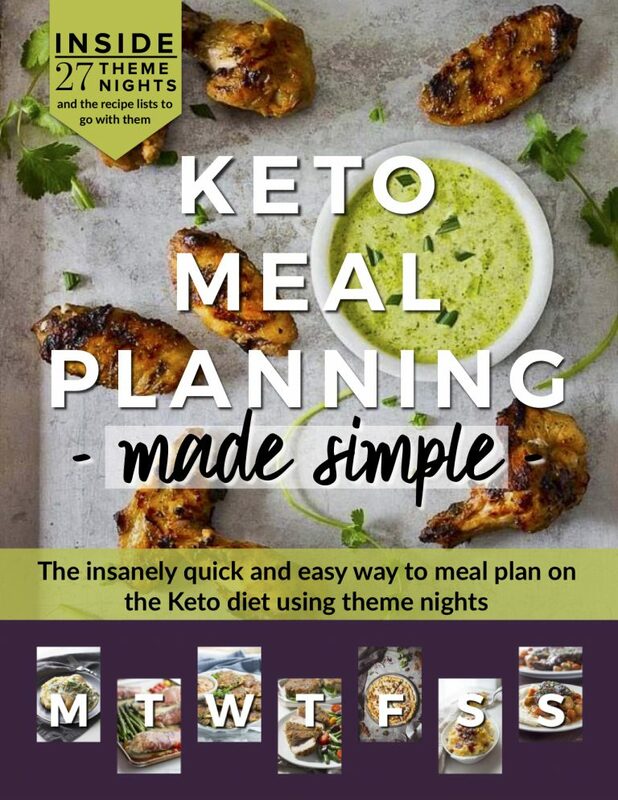 You truly are a keto genius to come up with the cornbread AND enchilada sauce. Both tasted amazing and I’ll be using these both in a variety of ways. AND the sweet corn extract is a MUST!! Yum. Thank you Low Carb Maven. You’re my hero. Do you think I could put this together and freeze it unbaked? I’m a huge fan of freezer meals. I made the Mexican cornbread the cornbread was a little dry I use the almond flour meal do you think that could have been my problem? It’s a miracle! A recipe the whole family loved that is delicious and low carb! I didn’t have the corn extract but it was still very tasty. I plan to add some sliced avocado on top next time. Thank you for the wonderful recipe-looking forward to trying more of yours! Would love to try this recipe, but I don’t have a cast iron skillet. Do I really need one? Kim, you’ve come up with another OUTSTANDING recipe. 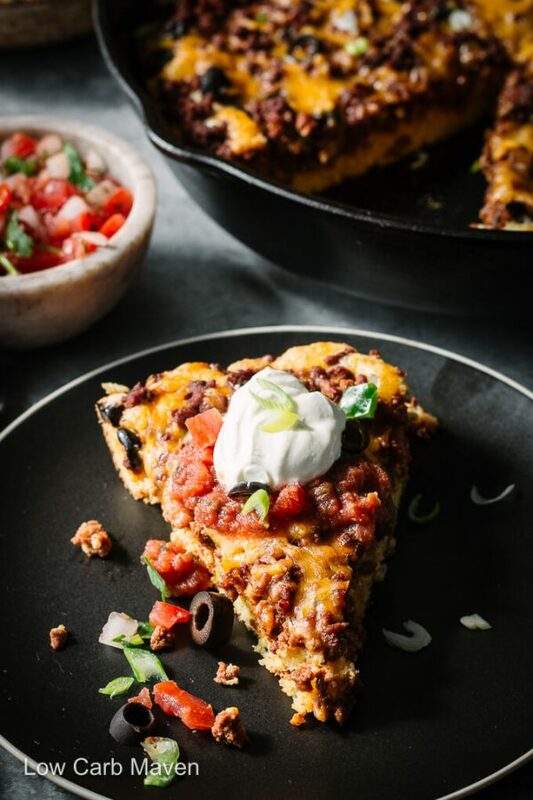 My husband and I don’t even like Mexican food, (never have) but this Mexican Cornbread Casserole Taco Bake was so delicious, we each had TWO slices. I followed the recipe exactly (with the exception of the corn extract), and it baked up perfectly in exactly 35 minutes. We topped each slice with a little sour cream, sliced grape tomatoes, cubed avocado, and a few sliced black olives, and practically inhaled each piece. I’ve made your focaccia bread recipe a number of times, but I would never have thought of using it as a base for something like this. 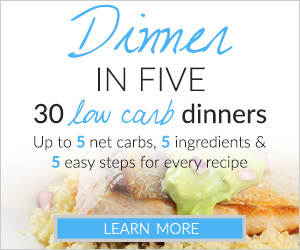 Thank you, thank you, thank you, for another quick, easy-to-prepare, scrumptious low carb recipe. One question: Should I reheat the half that remains in a 350 degree oven for about 15 minutes wrapped in foil? If not that, what would you suggest? I’ve never had something like this, so many great Mexican recipes that I would like to try. It’s an easy and hearty meal, Adina.